Mark Novak is a self-declared bohemian who loves to travel. So much so, he refuses to tie himself down to one location. “I didn’t get a divorce, quit my job, and sell my house to come to Central America and get married, buy a house, and get a job,” he says. Instead, he chooses to live life day-to-day. Mark’s journey started nine years ago, when he jumped on a plane in his home town of Seattle and headed to Costa Rica with a duffle bag and a computer. Having served in the army and worked as a teacher and a chef, he was looking for freedom and adventure and didn’t mind where he started. “I don’t love planes, but it’s a short trip to Costa Rica and economically it made sense,” he says. However, he soon found the three-month visa tedious, and discovered that he’d be able to stay for longer periods of time in Panama. Originally, hed spent time in the city of David, in the northwest of Panama. He then continued on to Bocas del Toro on the Atlantic Coast, where he was able to use his previous skill-set as a chef to make some extra income. After that, Mark visited the small town of Puerto Armuelles, where he now finds it harder and harder to leave. 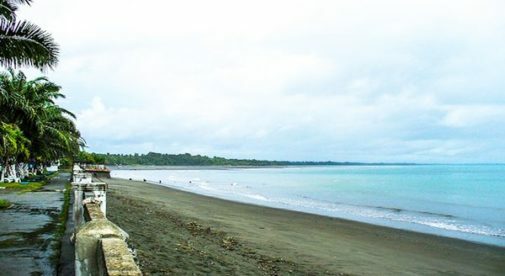 Puerto Armuelles is nestled amongst miles of unspoiled beaches and banana plantations, 45 minutes from the Costa Rican border on the Pacific Coast. It’s about as far as one can get from the hustle and bustle of the larger cities like David and Panama City. Instead, life is laidback and relaxed. “I can walk down the street and my biggest worry is the dog asleep in the road. It’s just that type of place,” says Mark. But that’s not to say that there isn’t plenty to keep him entertained. “There is always a parade or a softball game. The bomberos (fire department) invited me to their beach party. People are friendly and accepting.” Mark finds it an added bonus that he has been able to find reasonable rentals, which her discovered through word of mouth. “There is no directory for Puerto Armuelles. If you need something, you ask someone,” he explains. Fresh food in general is one of the main reasons Mark has continually returned to Central America and Panama specifically. “You don’t spend your days eating processed foods. The food here is just fresh and natural.” He spends many of his days visiting the local fish market, buying fruit and vegetables from local vendors, and preparing impressive meals. One of his favorites is homemade tuna sushi. “The $12 I pay for a fresh-caught tuna would barely get me an appetizer in Seattle,” he says.